The University of Leeds is a major teaching and research university in Leeds, West Yorkshire; one of the largest in the United Kingdom with over 32,000 full-time students. It is a member of the Russell Group and is ranked in the top ten of UK universities for market share of research funding. Established in 1904, it is one of the six original civic universities, and in 2006 it was ranked second for the number of applications received. The University's history is linked to the development of Leeds as an international centre for the textile industry and clothing manufacture in the Victorian era. 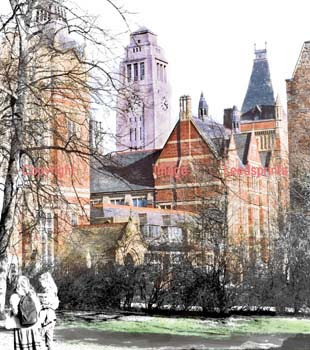 Its roots stretch back to the early nineteenth century and it was one of six civic universities in industrial cities given royal charters at the beginning of the twentieth century. Prior to this wave of expansion in higher education, only four universities - Oxford, Cambridge, London and Durham - were established in England. In 1831, the Leeds School of Medicine was set up, serving the needs of the five medical institutions that had sprung up in the city. Then in 1874, the School was joined by the Yorkshire College of Science, intended to provide education for the children of middle-class industrialists and merchants.Financial support from local industry was crucial (there is a Clothworkers' Court at the University to this day). The College of Science was modelled on Owens College, Manchester, established in 1851 as a non-sectarian alternative to Oxford and Cambridge, where religious tests were applied and those outside the Church of England were not allowed to receive degrees or were barred from entry outright. Owens College, like the earlier University College London, applied no such tests and was open to Protestant Dissenters, Catholics and Jews. While religious tests for students at Oxford and Cambridge ceased in the 1850s, northern colleges continued to promote themselves as offering a distinct type of teaching. They took pride in the progressive and pragmatic nature of their scientific education; a field in which the ancient universities, with their focus on theological study, were felt to lag behind. The Yorkshire College of Science began by teaching experimental physics, mathematics, geology, mining, chemistry and biology, and soon became well known as an international centre for the study of engineering and textile technology. When classics, modern literature and history went on offer a few years later, the Yorkshire College of Science became the Yorkshire College. In 1887, the College merged with the School of Medicine. 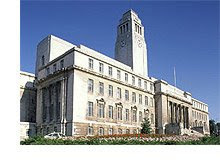 Leeds is a leading research institution, and a member of the Russell Group of Universities. In the most recent Research Assessment Exercise - that of 2001 - the University was placed seventh nationally for the number of top scoring researchers and eighth for 'research power' out of 173 institutions taking part in the exercise. Just under 800 researchers at the University were given ratings of 5* or 5, meaning that 70 per cent of the University's researchers were working at the highest level on projects of international importance. The University received the highest 5* grade, denoting work at the forefront of international research, in six subjects: Electronic and Electrical Engineering, Mechanical Engineering, English, Town and Country Planning, Food Science, and Italian. In The Times Higher Education Supplement Rankings 2007, Leeds was placed 16th in the UK, 27th in Europe and 80th in the world. The University has an excellent reputation for teaching and provides a wide range of courses for students. The Guardian University Guide 2008 rated it top in the country for Dentistry and Chemical Engineering, while a number of other subject were rated in the top ten or twenty. The University of Leeds Business School is regarded as one of the best in the UK. In its most recent ranking the school's MBA programme was placed at 15th in Europe by The Economist. In the Financial Times' Global MBA ranking for 2008, the Leeds MBA was ranked 48th in the World. During the 2005-2006 academic year, over 32,000 students were attached to 700 different first-degree programmes and 474 postgraduate degree programmes. Additionally, over 32,000 people were enrolled on short courses. It has also developed expertise in more distinctive and rare specialist areas such as colour chemistry, fire science and aviation technology with pilot studies. "Leeds is among the top ten universities for research in the UK and is internationally acknowledged as a centre of excellence in a wide range of academic and professional disciplines. We have an ambitious vision to join the top 50 universities in the world by 2015 through our distinctive ability to integrate world-class research, scholarship and education. A jump of 41 places to 80th in the THES-QS world university league table in November 2007 brings our ambition a step closer. Integrating research and learning and teaching is at the heart of our strategy. Our courses are taught by staff who are engaged in world-class research and cutting-edge professional practice. We invest our own resources in helping organisations turn university research into world-class products and services. From the invention of the Ultracane which helps blind and visually impaired people, to a spin-out company which provides expert services and new technologies for the biopharmaceutical, defence and healthcare sectors, we are at the forefront of innovation. Our size and international reputation enables us to offer one of the widest ranges of academic courses in the UK. During the current academic year there are over 30,500 students attached to 700 undergraduate and 474 postgraduate degree programmes. A further 31,382 men and women are enrolled on short courses with the University. Our graduates are highly sought after by employers and go on to succeed in all walks of life and are leaders in their field. Have a look at who has been here."